Dr. Melissa Hershberg has been interested in diet and nutrition since her residency. Armed only with Canada’s Food Guide, she found herself needing more with which to help patients. She’s since published two successful diet books and in addition to a family practise, Hershberg offers weight loss consultation through U Health Clinic in Toronto. The Good Diet is her latest eating plan, we talked about it and about what she considers key to maintaining a healthy weight, improving gut health and staying regular. TL: What inspired your interest in diet? MH: I was looking for a different way of counselling patients on weight loss and I came up with my own plan called The Hershberg Diet. And the tenant there, and same with The Good Diet, is really teaching that water is an important component of food. And that foods with the highest water content are going to fill you up with the fewest calories. And it’s important even if you’re talking about gut health. You want high-water foods like fruits, vegetables, lean protein and lean dairy. And the more hydrated we are the less the chance of constipation. And I find with seniors who suffer from dehydration also suffer from constipation. TL: Let’s talk about weight first, does drinking water help? MH: So sometimes we’re dehydrated. We think we’re hungry but it could be that our body just wants more water. So a lot of people are chronically dehydrated and looking to eat when they should be thinking about drinking first. TL: How do we know if we’re actually thirsty rather than hungry? MH: One is just a dry mouth. People think they want to eat something or put in a mint. First, try having something to drink. Also, if you feel like you’re hungry but you’ve just eaten, think about when was the last time you had a good glass of water. 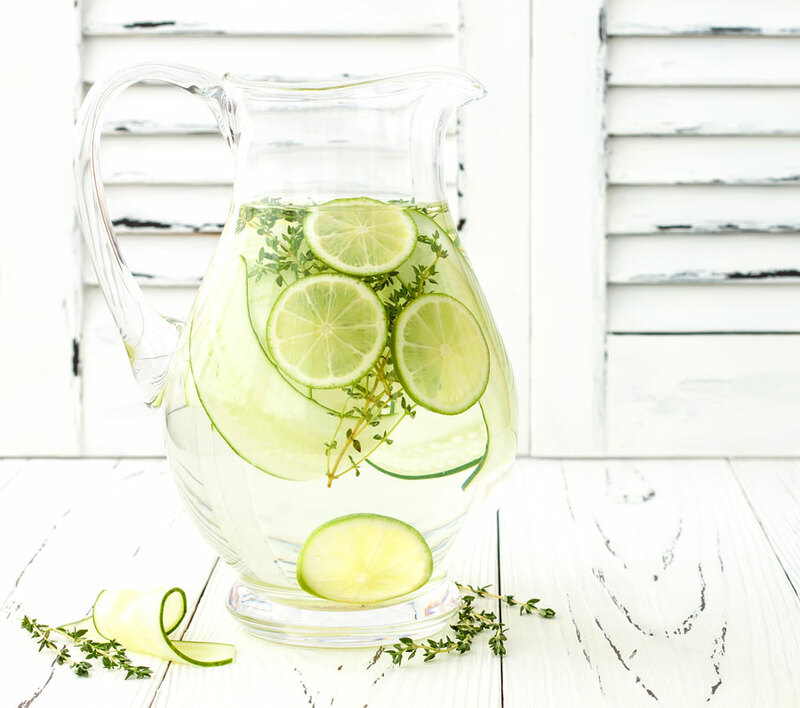 And let’s say you’ve been doing something dehydrating like drinking coffee all morning or drinking alcohol in the evening and then you’re feeling hungry — it might actually be that your body wants water. TL: How many glasses of water should we be getting each day? MH: Try to get six to eight glasses per day. And even to set a timer to remind yourself to drink. It doesn’t have to be a full glass but you could think about taking something to drink every hour. TL: You also mentioned gut health, that’s a hot topic these days. MH: First of all, there’s been a lot lately about gut studies correlating health with weight. So it seems that people who have a healthy, diverse microbiota in the gut tend to struggle less with their weight. So one way to improve the health of our gut is to feed the healthy bacteria. And the way to feed the healthy bacteria is with what we call prebiotic foods; those that are high in fibre because good bacteria in our gut live on fibre — so fruits, vegetables, legumes, nuts, seeds and whole grains. Number two is to get probiotics, naturally — I’m not talking about a pill. Natural probiotics are things that have already been fermented. We’re talking about yogurt, sauerkraut, pickles, kimchi, kefir. And kefir [fermented milk] is a really easy thing to incorporate into your diet. You can mix it with some berries and maybe some seeds in the blender and right away you start your day off getting a probiotic and a prebiotic. TL: Is it more difficult to maintain gut health as we age? MH: As people age they rend to have more health conditions and be on more medication. And even if you’re doing everything right, that can present challenges. Antibiotics will wipe out some of the good bacteria in our colon. And if you’re on painkillers, it can make the colon a little sluggish and that’s where they may need to take a laxative, like a Senokot, to help encourage the peristaltic contractions. And it’s not just painkillers, there’s a whole slew of medications that can either wipe out the good bacteria or cause our gut to become sluggish. TL: Aside from laxatives, what can we do? MH: Get active and make sure you’re hydrated. The combination of being dehydrated and being inactive also contribute to slowing down the digestive system. And sometimes the portion of food can get smaller as we age, so make sure with the food you are getting, you’re maximizing the benefit from. So increasing the fibre and the fruits and vegetables, whole grains, and the nuts and seeds. TL: Are there serious side effects of constipation? MH: First off, make sure there’s no medical cause. Talk to your doctor if it’s chronic. Make sure that you don’t have any alarming symptoms like blood in the stool or unexplained weight loss. We tend think about constipation as a nuisance — it casues gas and blotting and it’s uncomfortable. But actually, straining hard for a bowel movement can lead to syncope, which is fainting. It can also lead to ischemia, which is a lack of blood flow to the brain — it’s rare, but … And it can also lead to impactions, that ‘s when the stool gets stuck in the colon. And that can lead to an obstruction where you could, theoretically, get a perforation of your colon. So constipation, if it gets bad enough, can be dangerous. TL: Tell us more about The Good Diet. MH: So it’s available online and we can ship the program to people. It still focuses on those high-water foods but it also focuses on foods that don’t spike blood sugar as well as foods high in protein. Which is important, too, because protein is what fills us up and it also burns some calories in its breakdown. And as we lose weight, a lot of people lose muscle mass, but if we’re getting enough protein we’re also preventing that muscle lose. For two weeks I’m just going to give you the food; the shake for breakfast, the soup for lunch and a snack and you just cook your own dinner and snack on veggies, when you’re hungry. When they’re comfortable I say, ‘Now you can make your own meals, here are recipes and here’s some good snack ideas.’ So it just holds the hand a little bit. It isn’t meant to be restrictive. This isn’t saying, ‘You’re never going to have a peie aof cake again.’ That doesn’t work. That just sets people up for cravings. Instead, it’s teaching people how to create a pyramid with their diet where the bulk of it is the healthy, nutrituius foods, which leads to a healthy gut. TL: You’ve done a lot of coaching on weight loss and nutrition, is there a common thing we’re doing wrong? MH: Yes, sugar. The added sugar. So the processed foods, the sweets, the desserts, the muffins — the things that are so easy to grab. The problem with the processed sugars is number one, it spikes your blood sugar. This is why we’re seeing such an increase in rates of diabetes and obesity. And number two, sugar feeds the bad bacteria in our colon. So always look at the added sugar. Yes, it’s in ketchup but if you’re having a little squirt — not the biggest deal. But when you’re having a soft drink for lunch and another one for dinner, and then you’re having an iced coffee for breakfast and then you’re having a muffin — then it all adds up and puts you over the top. I saw a study that showed correlation between gut health and anti-aging, I don’t know what the casue and effect is; whether people that age well tend to have healthier guts or having a healthy gut leads to healthier aging but either way, we can control it. Dr. Melissa Hershberg is working with the makers of Senokot to educate people on how diet, lifestyle and options like senna can help people stay regular and address constipation.